This homemade costume for babies entered our 2014 Halloween Costume Contest, and won 3rd place in the Cutest Baby Costume nomination! My son Corbin is 6 months old and loves to scream. 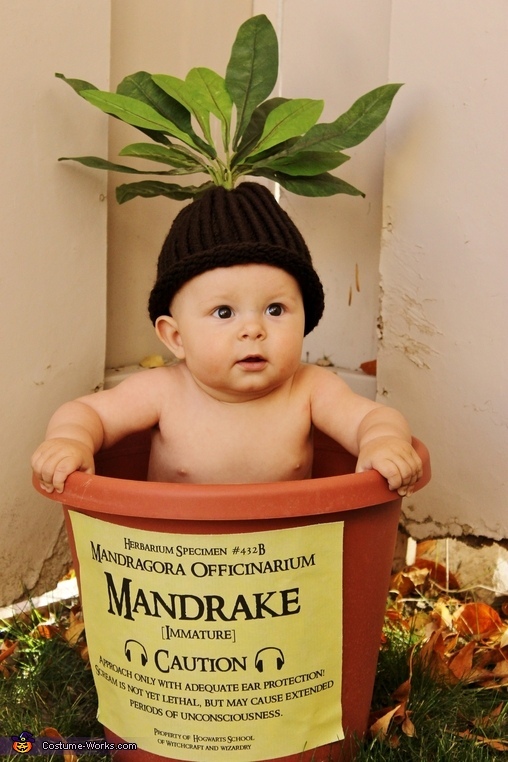 My family LOVES Harry Potter and we started calling him our little Mandrake a couple months after he was born (when the screams of joy started). Once October hit I decided that it would be a way fun costume to make for him! I found a printable label on Pinterest by searching "mandrake costume", I got a flower pot from our greenhouse and I loomed a baby hat using brown yarn. I then got some fake plant leaves from Michaels and hot glued them to the top of the hat. It turned out absolutely adorable! He plays the part perfectly by screaming as loud as he can. Plus his chubby rolls make it even better!